Illegal aliens say that rancher's efforts to stop them from using his property to cross illegally into the United States violates their civil rights. The plantiff's trial is being handled by (who else) MALDEF. An Arizona man who has waged a 10-year campaign to stop a flood of illegal immigrants from crossing his property is being sued by 16 Mexican nationals who accuse him of conspiring to violate their civil rights when he stopped them at gunpoint on his ranch on the U.S.-Mexico border. Roger Barnett, 64, began rounding up illegal immigrants in 1998 and turning them over to the U.S. Border Patrol, he said, after they destroyed his property, killed his calves and broke into his home. In March, U.S. District Judge John Roll rejected a motion by Mr. Barnett to have the charges dropped, ruling there was sufficient evidence to allow the matter to be presented to a jury. Mr. Barnett's attorney, David Hardy, had argued that illegal immigrants did not have the same rights as U.S. citizens. Mr. Barnett told The Washington Times in a 2002 interview that he began rounding up illegal immigrants after they started to vandalize his property, northeast of Douglas along Arizona Highway 80. He said the immigrants tore up water pumps, killed calves, destroyed fences and gates, stole trucks and broke into his home.Some of his cattle died from ingesting the plastic bottles left behind by the immigrants, he said, adding that he installed a faucet on an 8,000-gallon water tank so the immigrants would stop damaging the tank to get water. Mr. Barnett said some of the ranch´s established immigrant trails were littered with trash 10 inches deep, including human waste, used toilet paper, soiled diapers, cigarette packs, clothes, backpacks, empty 1-gallon water bottles, chewing-gum wrappers and aluminum foil - which supposedly is used to pack the drugs the immigrant smugglers give their "clients" to keep them running. This is the absolute height of ignorance. I'm totally gobsmacked by the indifference to this man's property rights, civil rights, and human rights in the rush to pander to the poor illegal aliens whose "right" to trespass, destroy private property, and annilihate an eco-system has been challenged by someone who refuses to roll over and let them do so. Last edited by Kele; 02-09-2009 at 08:12 AM..
Well! I have no idea what this guy is so upset about, do you? After all, these uninvited and unwanted 'guests' and are only here to do the jobs Americans won't do (which presumably include littering on a monumental scale and killing livestock). Besides, the gringo stole their land! Why would he even think of trying to stop them? Surely he is aware that the laws that apply to the rest of us do not apply to them. I know! He must be.................A RACIST!! Anyone on the proillegal side like to comment on how this is even remotely fair? Blacknight? Antialphabet? Anyone? Leaving aside the illegals for just a moment..(remember, they don't 'get it', and aren't responsible ), it might be well to remember that some American lawyer decided to take this case; some American court clerk decided it was OK to file the paperwork; and some American judge decided the case had enough merit to put it on his court calendar. THAT'S what I find truly upsetting. ALL of these Americans have a certain amount of discretion built into their job descriptions, and SOMEBODY, at some point along the line, COULD have just tossed this whole silly thing out as a "frivilous lawsuit" unworthy of the court's attention. But they didn't. The illegals? They're acting on instinct. Coming from a place where the law is basically a "joke", from THEIR point of view, the open border is nothing more than an 'invitation', and the ability cross it with impunity, and to THEN file a lawsuit here, is nothing more than a 'winning lottery ticket'. I doubt they give it much more thought. The people I'm REALLY angry at are their "enablers", as stated above. By the way, I wonder how these illegals ever got the idea that the law is a "joke"?...hmmm....imagine that..
established immigrant trails were littered with trash 10 inches deep, including human waste, used toilet paper, soiled diapers, cigarette packs, clothes, backpacks, empty 1-gallon water bottles, chewing-gum wrappers and aluminum foil - which supposedly is used to pack the drugs the immigrant smugglers give their "clients" to keep them running. If you want to see this first hand you can see it about anywhere near the border. The Pacific Coast Trail looks more like a subway path close to the border with all the garbage being left behind. This case should be entered into the archives under the “judicial travesty” category. At this rate, we won’t be allowed to prevent an illegal alien from entering our homes and sitting down at our table a dinnertime. This is beyond absurd. That comic would be oh so much more funny if it wasn't true. Maybe someone should point out that illegal aliens have no "Civil rights". 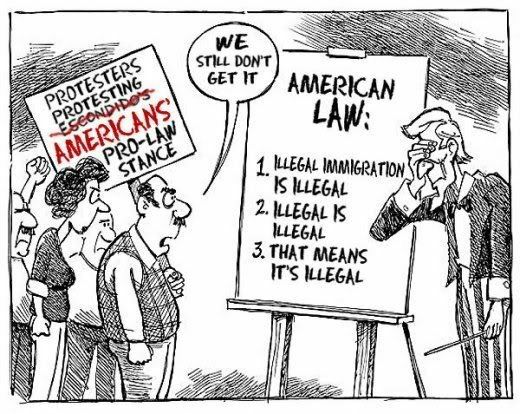 That only applies to LEGAL AMERICANS! This is just as absurd as Bill Clinton trying to hide behind the "Soldiers and Sailors relief act" to get out of a sexual harrasment suit. this seems like a waste of time and money. its his land. his domain. sure he cant imprison or hold people hostage, but in this case they were trespassing. what civil rights were trqampled? maybe they are charging him with kidnapping? i dont know. but there has to be a reason this has gone so far. tho details are not fully disclosed i will stay on homeboys side of the story here. I couldn't believe this article when I read it. We need a bunch more just like him. You'd think word would've gotten out to avoid his ranch considering he's rounded up some 28,000 illegals over the past 10 years. Today I am officially depressed over the state of our country and our legal system.